Normally known for his contemporary interior designs, Marcel Luchian has expanded outside into the terrain of architecture with his single family M House in the Republic of Moldova. 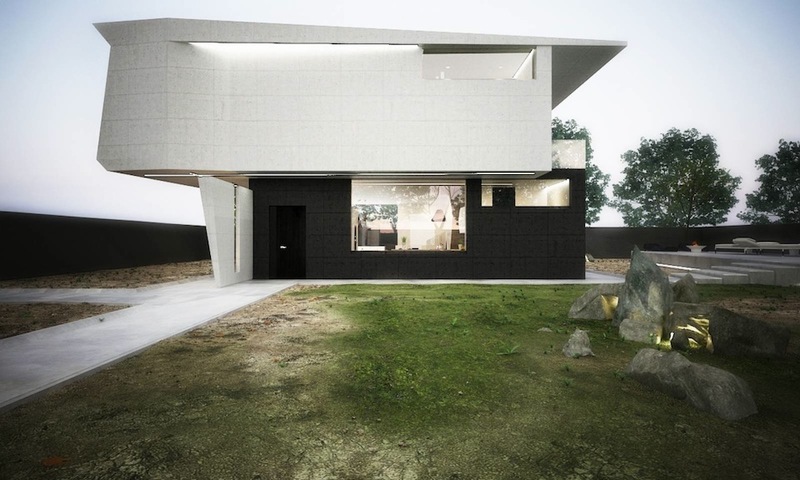 Presented in May at the 2013 GIS Architecture Conference in Romania, the augmented minimalist design features expansive sun exposure combined with an underlying thermal efficiency. The most prominent feature of the home though is its staggered structure: the heavy top volume is dislodged and shifted above the first floor foundation, creating a natural protrusion and displacement. Peripheral slits into the resulting exposed surfaces create both dimension and the space for light installations. With floor-to-ceiling windows oriented along the ecliptic, sunlight is used to efficiently illuminate the house during the day. To create a soft contrast to the sheer walls, shaded concrete is used for the remaining exterior and interior surfaces. Inside, Luchian balances aesthetic form with energy considerations. Light fixtures, cabinets, and furniture are given geometric texture through shaved corners, exposing their interior dimensions. Hidden beneath the floors is the homes primary heat source: radiant heating tubes. These are used throughout the home to efficiently and quietly heat the home during Moldova’s long winter season.